Whoops! We almost let the weekend catch us slipping. We promised to keep you up-to-date on the truly nice sales going on this season, so here's a tidbit from the brides-to-be who love personalized accessories. 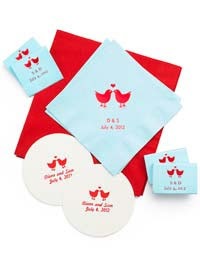 Our old friends at The Knot are having a fab sale on monogrammed goodies for your reception like napkins, matchbooks, favors and lots of other things. When you get a chance, it might be worth your while to see what's On Sale at The Knot Wedding Shop. Wordless Wednesday: Kiss Me, Honey! What Exactly Does A "Day Of" Coordinator Do? Helping Out Your Girls - And Yourself! Are You Gaining Weight & Stressed Out?